I love being tanned. However, I have never in my life been to a tanning salon. Imagine that! I am not sure why. Maybe because every year I went on one or two vacations and always got a real nice tan that lasted for a while and rest of the year used self tanners or just left my skin as is. I have tried a bunch of different self tanners and almost all sucked. I’ve heard a lot about St Tropez but never could dish out $40 for it until a few days ago and I am so glad I did! This product is AMAZING. Before I go on here is my before and after pic. The after pic was taken immediately after application. There are a few different types of St Tropez self tanners but I picked up a bronzing mousse. 2. Does not smell like a self tanner. The scent is very nice and pleasant. 3. Dries fast and does not stain. 4. It is NOT orange in any way at all. 6. As soon as you put it on, you notice a difference. Your skin is slightly golden. But then wait for it! That’s not it as the tan develops deeper. After about an hour, you are more of a deeper golden and with each passing hour it develops more beautifully. 7. It looks very natural which is the best thing. 8. No patches or streaks. 1. 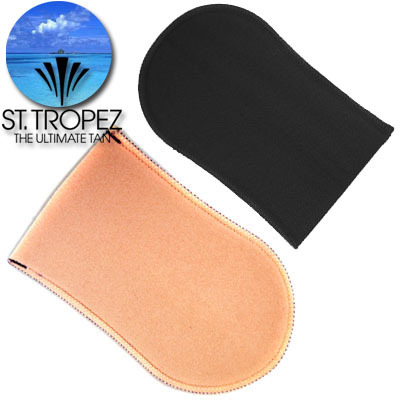 Get a St. Tropez mitt that you will use to apply the bronzing mousse. I thought at first the girl at Sephora was trying to make a sale by pushing this mitt on me but I am glad I got it as this mitt is what helps you apply the product evenly across your body, and eliminates the streaks and patches. 2.EXFOLIATE EXFOLIATE EXFOLIATE! I know everyone stresses this but it’s for a reason. Before applying any self tanners, it is so important to exfoliate your skin, paying special attention to the more rough areas (elbows, knees, ankles). It gets rid of the dead skin cells. 3. Best time to apply a self tanner is after a shower (during which you exfoliated) as your skin will be moist and pores open. It allows for the product to really get in and last longer. 4. I pumped two times for my arms, 4 pumps for legs and 2 or 3 for stomach/chest and back area. 5. I pumped the product onto the mitt and worked it onto my skin in circular motion until I rubbed it all in and could not see the product residue anymore. 6. For knees, ankles and elbows I rubbed only the excess product after I pretty much ran out of it. 7. After applying, I waited about 2 mins before getting dressed. However, in about 10 mins I was completely dry! 8. Shower the next day and don’t be alarmed as you will see your tan come off but what you will be left with is even better and more natural looking. Don’t be alarmed as when you are applying the mousse, it will look dirty and uneven and patchy. While it’s drying it also looks like that but as the tanner starts to set into your skin and dries, it is absolutely streak free and even. It’s weird how that works and I am not sure why but it made me panic at first. There was a difference right away but I’d say after about 3 hours my tan was all noticeable and a gorgeous golden/brownish colour. This product was well worth the money and I will be buying it again. You should! It’s great. The only thing that started to annoy me slightly is that it only lasts for about 2 days and then it fades away completely. I would like to last a bit longer. Other than that it’s the most natural looking and gorgeous golden tan. Let me know if you do try it!